Procon Technology has searched all over for these value-for-money OEM, embedded or industrial PSUs (Power Supply Units), SMPS (Switched Mode Power Supplies) or Switch-Mode Rectifiers. Please see prices below and email us regarding your quantity requirements or special application. OEM, wholesale or re-seller discounts are available. Meanwell, also supply mains power adapters from 12W to 280W, Battery Chargers (including UPS), DC-DC Converters, DC-AC Inverters, LED Power Supplies and medical power supplies! 1. Hi Peter, ...Also, thank you for your catalogue and CD. Much appreciated. I'll definitely get back to again. 2. Order received and despatched quickly, good communication. Received extra information! 3. Super fast delivery, great communication. Will buy again. The LRS Series provides 35, 50, 75, 100, 150 Watt output in voltages of 3.3V, 5V, 12V, 15V, 24V, 36V or 48V. The series is designed as a higher wattage, higher efficiency, "drop-in replacement" for the RS series, with a smaller and lower profile case (1U - 30mm high). The LRS Series (cw the RS Series) also provides higher output isolation 1.25kV cw 0.5kV, lower AC leakage <0.75mA cw <2mA. It meets industrial use standards AND safety standards for domestic use AND has an input to output isolation 4kV cw. 3kV, meets Over Voltage Category (OVC) III. With 36V output (adjustable from 32V to 40V) option available! Lower price and higher reliability than RS series... LRS-150 also with Over Temperature Protection (OTP). For a video of the LRS series - click here. Low-cost 200W and 350W units are also available! Please see the specs before purchasing these! The RS Series (also called the G3 series) provides 15, 25, 35, 50, 75, 100 or 150 Watt output in voltages of 3.3V, 5V, 12V, 24V or 48V. This series replaces the G1, G2 and NES series and provides higher reliablity and longer life with higher temperature operation! Suitable for general use in OEM equipment in the office or home or for use in telecommunications, electronics or industrial applications. RSP series (above right) - 75W to 3000W now up to 5 year warranty! The RSP Series provides 75, 100, 150, 200, 320, 480, 500, 750, 1000, 1500*, 1600, 2000, 2400 or 3000 Watt output in voltages of 2.5V, 3.3V, 5V, 7.5V, 12V, 13.5V, 15V, 24V, 27V, 36V or 48V. The series is designed for high wattage output in compact sizes, with active Power Factor Correction (PFC), (most) with constant current limiting and remote ON/OFF control (except RSP200 and RSP320). The smaller wattages provide low profile units (less than 30mm) with all units fitting a 1U rack except the RSP1500, RSP2400 and RSP3000. All wattages above 500W provide remote voltage sensing and 750W and above remote voltage control (using 0-5V) with the RSP750 and RSP1600 also providing remote current control. Wattages above 1000W can also be connected in parallel to increase the output up to 9000 Watts for the RSP3000. *RSP-1500 will be phased out and replaced by the RSP-1600. The 5000W and 10000W RST series now available in 24V, 36V & 48V - with parallel operation up to 20,000W. Curently, Procon Technology is supplying a configuration of three RST-5000 units for 15,000W output driving a low-voltage temperature controlled heater used in 3D metal printing! HRP/G series (not shown) - High Reliability - 5 year warranty! The HRP/G Series provides 75, 100, 150, 200, 300, 450, 600 or 1000 Watt output in voltages of 3.3V, 5V, 7.5V, 12V, 15V, 24V, 36V or 48V. A simple adjustment by potentiometer allows voltages of 13.8V, 27.6V and 55.2V, as well as 9V, 32V (any voltage between 10.2V and 55.2V). The series is designed for high reliability, with active Power Factor Correction (PFC), with constant current limiting and low and high temperature operation. The HRP-75, HRP-100 and HRPG (Green) models have remote ON/OFF control with low power consumption (when OFF) and high efficiency to save energy! In addition, all HRPG models have an auxillary 5V at 0.3A output to drive external circuitry (this voltage output remains ON even when the remote is OFF). All models from 150W to 600W provide remote voltage sensing to compensate for cable losses. For medical approved units, see the MSP Series - click here. Click on the part number below to view the data sheet (PDF file) showing full specifications. IRM-30-vn, 30W module v = 5V, 12V, 15V, 24V, 48V, n = b, ST $45.00 $49.50 news! IRM-45-vn, 45W module v = 5V, 12V, 15V, 24V, 48V, n = b, ST $45.00 $49.50 news! IRM-60-vn, 60W module v = 5V, 12V, 15V, 24V, 48V, n = b, ST $50.00 $55.00 news! RSP-75-v, 75W SMPS v = 3.3, 5, 7.5, 12, 13.5, 15, 24, 27, 48V..... pdf $80.00 $88.00 news! HRP-75-v, 75W... v = 3.3V, 5V, 7.5V, 12V, 15V, 24V, 36V, 48V.. pdf $100.00 $110.00 . RSP-100-v, 100W SMPS v = 3.3, 5, 7.5, 12, 13.5, 15, 24, 27, 48V $100.00 $110.00 news! RSP-150-v, 150W SMPS v = 3.3, 5, 7.5, 12, 13.5, 15, 24, 27, 48V $100.00 $110.00 news! LRS-200-v, 200W... v = 3.3V, 4V, 5V, 12V, 15V, 24V, 36V, 48V $80.00 $88.00 new! RSP-200-v, 200W... v = 2.5,3.3,4,5,7.5^,12,13.5,15,24,27,36,48V $100.00 $110.00 news! ERPF-400-v, 400W... v = 12V, 24V, 48V... splash-proof design! $125.00 $137.50 new! UHP-750-v, 750W... v = 12, 24, 36V, 48V..................................... pdf $400.00 $440.00 new! UHP-1000-v, 1000W... v = 12V, 24V, 36, 48V... remote on/off, V+I adj. $540.00 $594.00 new! SP-240-v, 240W SMPS v = 5V, 7.5V^, 12V, 15V, 24V, 30V, 48V $140.00 $154.00 . LRS-350-v, 350W... v = 3.3V, 4V, 5V, 12V, 15V, 24V, 36V, 48V $100.00 $110.00 . RSP-500-v, 500W... v = 3.3V, 4V, 5V, 12V, 15V, 24V, 27V, 48V $200.00 $220.00 news! ..................40-110% V + I adjust, ideal battery charger, small in size. $360.00 $396.00 news! ..................70-110% V adj, alarm o/p, parallel up to 5400W, 12V aux. $700.00 $770.00 . ..................40-115% V adj. 20-100% I adj., parallel up to 9600W $720.00 $792.00 news! RPB-1600-v, 1600W Charger v = 12, 24, 48V... V+I adj. 3 stage, CAN $800.00 $880.00 news! ..................40-115% V adj, alarm o/p, parallel up to 7200W, 5/12V aux. $800.00 $880.00 . ..................20-110% V adj, alarm o/p, parallel up to 6500W, 12V aux. $800.00 $880.00 . ..................20-110% V adj, alarm o/p, parallel up to 8100W, 12V aux. $900.00 $990.00 . ..................20-120% V+I adj, alarm, parallel up to 20000W, 12V aux. $2200.00 $2420.00 news! ..................20-120% V+I adj, alarm, parallel up to 20000W, 12V aux. $4000.00 $4400.00 news! 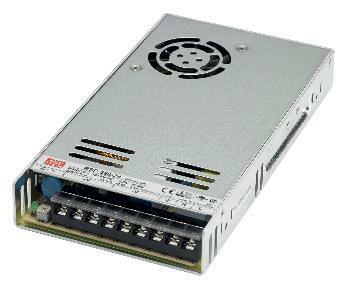 RCP-1000-vC, 1000W SMPS v = 12V, 24V, 48V... with I2C interface $630.00 $693.00 . RCP-1600-v, 1600W SMPS v = 12V, 24V, 48V... 40-125% V adj. ...................20-100% I adj., parallel up to 24000W, PMBus interface! $850.00 $935.00 . ...................3 stage charge, parallel up to 24000W, PMBus interface! $900.00 $990.00 news! RHP-1Un, 19" 1U rack system for 1..5 x RCB/P-1600 - HOT SWAP! $800.00 $880.00 . A range of plates, brackets and clips are available from Meanwell to mount the metal caged supplies - click here. Note 5V^, 7.5V^ indicates it can be set to 6 Volts. Some 7.5V^ can also be set to 9 Volts. All MeanWell power supplies we sell have international approvals (UL, CB, CE, TUV, EMC) and Australian C-tick approval and have built-in short-circuit, overload and OVP (Over Voltage Protection). All fan cooled models have OTP (Over Temperature Protection) plus many others (see data sheets). Some small models (e.g. RS-15) with integrated devices also have OTP. To determine the output current divide the wattage by the voltage. e.g. 240 Watts at 24V provides 10A. Note the maximum current is derated at temperature extremes (see data sheets). Some models have BSMI / CCC / CAS / CUL / ErP / EISA / FCC / GL marine / IP65 / IP67 / LPS / MEPS / SEMI F47/ SELV approvals or compliance. All test reports, certificates and declarations are available as PDF documents... please request a copy by email. SM = Switch-mode operation (compact and light weight). All SPSU (Switching Power Supply Units) have regulated outputs (adjustable by +/-10% up to 20%) and generally operate on 90-264VAC, 47-63 Hz. Or can also operate on 120-370VDC. The CGL, HRP, SDR, SP and USP (anything with 'P' on the end) versions have active PFC (Power Factor Correction) and constant current limiting (rather than hiccup mode). The SDR-480P, HRPG-600, SPV-1500, PSP and RSP/RCP versions also allow parallel operation. DC-DC versions (SD series) operate on 12V (up to 50W only), 24V, 48V or 110V DC up to 1000W. Note, use standard AC-DC SMPS for 120VDC to 370VDC input (from 10W to 1500W++). Some supplies now allow 430VDC up to 780VDC !!! PSP range all have been phased out except PSP-600. For the PSP-500 we recommend using PSP-600 or HRPG-600 (24V to 48V only for parallel operation). For PSP-1000 use RSP-1000. For PSP-1500 use RSP-1500 or RSP-1600. The RSP range above 750W now provides a 5 year warranty compared to 3 years for the PSP range and 2 years for the old SCN range. Please contact us for all your special power supply needs. Mean Well also have supplies in miniature high temperature versions (RS, RD, RID, RT, RQ series), open frame (PLP, ULP, PS series), multi-rail (D, T, Q, QP series) and in IP64/IP67 environments, see the LED range for LED lighting and moving sign applications outdoors or wet area indoors. For enclosed power supplies (12V to 48V) see the HEP-600 or the HLG Range which allows non-electricians to open control cubicles safely as, with a 240VAC plug and socket fitted, no exposed 240VAC terminals are used. 19 inch rack mount system for the RCP-1000, RCP-1600, RCB-1600, RCP-2000, DRP-3200 and DBR-3200. Now available is the RCB-1600 and DBR-3200 series with 13.8V, 27.6V and 55.2V outputs for battery charging in telecommunications and other large battery charging systems. The DRP-3200 and DBR-3200 provides 12800W per rack with up to 3 racks in parallel for 25600W in total! All units have hot-swap operation, internal ORing diode, AC OK and DC OK LED/signals plus over-temperature signal and I2C or PMbus serial data interface option! The I2C or PMBUS (Power Management Bus) option provides ID information (serial number, model, date of production), provides the analogue value of voltage, current and internal temperature and reports faulty AC input, DC output, temperature and fans! See the Monitor Unit - RCP-MU The I2C/PMBUS information allows you to monitor each power supply by microcontroller or computer to determine if a fault has occurred (or may be about to occur) and to monitor the 'Total Run Time' of the PSU to determine when it should be replaced. For Meanwell 19" rack power supply application guide - click here. The RCP-1000 is a near equivalent system to the TDK-Lamda (Amtex) FPS1000. The Reliable 'S' or RS series provides drop-in replacements for the NES series and S series with higher wattage output !!! Replace NES-15 with RS-25... NES-25 with RS-35 or LRS-35 or LRS-50... NES-35, S-25 with RS-50 or LRS-75... NES-50, S-40 with RS-75 or HRP-75* or LRS-100... NES-75, NES-100, S-60 with RS-100 or HRP-100* or LRS-150 or HRP-150*... NES-150, S-100F with RS-150 or HRP-200* (side screw holes different). S-150-13.5, S-150-27 with AD-155(output terminals different). S-150-12, S-150-24, S-150-48 with ADS-155(output terminals different). *note, on the HRP or HRPG units the terminals overhang by 15mm. Tests conducted on the some RS series models shows that they can provide CONSTANT POWER OVERLOAD capability (down to 50% voltage) and do not always go into HICCUP MODE. Constant power is better for driving motors, capacitive loads (e.g. DC-DC converters or DC-AC inverters) and other loads where the inital start-up current is high! Please email Procon Technology, for a FREE catalogue of Meanwell Power Supplies (LED catalogue also available), these catalogues are now printed using 'Soy Ink'... for more environmentally friendly printing allowing paper to be more easily recycled! 1. @With short-circuit and overload protection, some supplies shut-down and must have the power cycled off and on again to recover, some have a hicup mode and recover automatically and others have constant current or constant power limiting. Note, when driving motors, incandescent lights and highly capacitive loads the supply must allow for the peak current or a constant current limited output is recommended (e.g. DR, EDR*, HEP, HLG*, HRP, HRPG, MDR, MSP, NDR*, PSP, RCP, RSP*, SDR, SP*, SPV, WDR* version). *some units only. Please check what mode of operation you require before purchase! 2. Most MW power supplies have exposed supply input terminals (except laptop and desktop style) therefore they must be used inside a control cubicle or suitable enclosure for OEM (Own Equipment Manufacturer) use. For desktop power supplies from Manson and Meanwell - click here. Note, only the LED and the HEP ranges of power supplies provide outdoor IP65/IP67/IP68 operation. Click here to view the enclosed power supplies for Harsh Environments! 3. All MW power supplies operate from -10�C (new units from -55�C) to 60�C (most RS, MDR, SDR and WDR range from -20�C to 70�C, CLG/HLG/HRP/HRPG from -40�C to 70�C and HEP from -55�C to 70�C). The current output must be derated at temperature extremes and with low input voltage. 4. All MW power supplies have floating outputs (except the SP-480) and can be used as positive or negative earthed supplies and can be connected in series for increased voltage. Note, diode protection against reverse voltage may be necessary and, remember, any voltage above 60VDC is hazardous - the requirement of SELV (Safety Extra Low Voltage) of IEC60950-1. Please ask for information for this and other applications (e.g. using them in parallel or as a battery charger). 5. Small power supplies (up to 320W) may be DIN rail mounted with additional hardware. L brackets are also available - click here. 6. 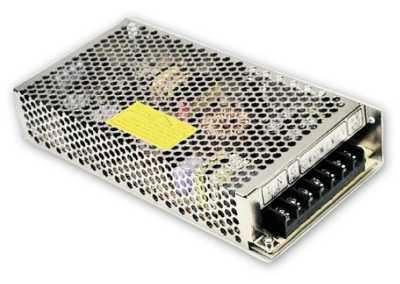 Some MW power supplies have auxilary voltage outputs (5V, 12V or 13.8V - e.g. for battery charging), parallel operation (extending the current output), active Power Factor Correction (PFC), extended temperature operation, remote on/off, remote 20%-120% voltage control using 1-5V, remote voltage sensing (to compensate for external wiring) and power fail signal outputs - please ask if you require these features. 7. The HRPG-300/MSP-300 are possible replacements for the Cosel PBA-300 and the HRPG-600/MSP-600 for the Cosel PBA-600. The 'Mean Time Between Failure' or MTBF is calculated according to the probability of accidental device failures, and indicates reliability of devices. Therefore, it does not necessarily represent a life of the product. The life expectancy or life cycle of a power supply is most dependent on the electrolytic capacitors used. The deterioration speed of the electrolytic capacitor varies considerably according to the ambient temperature. Generally the speed follows �Rule of Two for every 10�C�; for every 10�C increase in temperature the rate of degradation doubles according to Arrhenius�s equation. The reason Meanwell have such good MTBF specs on in-line or laptop style power supplies is that they use 105�C electrolytic capacitors whereas others use ordinary 85�C caps (open that 'cheap' unit and take a look)*. Finally, 2017 figures on the '2 year field return rate' suggest that around 1 in 6600 units is ever returned due to faulty parts or workmanship (that's x6 less returns in 10 years). Procon Technology can honestly say, until 2018*, due to Meanwell's extensive burn-in testing, that we have NEVER had a D.O.A (Dead on arrival) nor premature failure of a Meanwell power supply (I wish all the products we sold were like this). The only unit we have had returned within 12 months of installation had a "zapped" nest of ants in it! p.s. We recommend that all power supplies be checked on a regular basis and steps taken to ensure vermin (ants, rats, birds) do not cause mischief! In outside applications, where this could be a problem, we recommend the use of a IP65 or IP67 rated units. e.g. HLG or HEP range. *yes! It had to happen one day... our first DOA unit, a RSP-200-27 power supply! Remember, in the last 10 years we have sold 1,000's of Meanwell power supplies! NOTE: An additional method of calculating the MTBF, the Telcordia/Bellcore SR-332, is now given on DPU, PSPA, RSP (750W an above) and RST devices! Plus chargers and 19" rack units. This is considered a more accurate method of determining the MTBF then MIL-HDBK-217 for commercial products. Mean Well Enterprises Co., Ltd. is one of the leading switching power supply manufacturers in Taiwan or ROC. Established in 1982, it is a TQM (Total Quality Management) company and has been ISO-9001 certified since 1994. Besides the Industrial AC to DC power supplies, the product line also includes; mains adapters, LED power supplies and drivers, DC-DC converters, DC-AC inverters and battery chargers. Total Quality Assurance and Customer Satisfaction are the central goals of MeanWell. They and Procon Technology believe that the industry is one where reliability, functionality and cost are of great importance, but that it is reliability that differentiates the truly superior product. So, every product in the Mean Well range is the result of rigid procedures governing design, Design Verification Test (DVT), Design Quality Test (DQT), component selection, pilot-run production, and mass production. To this end, Mean Well have recently implemented a new and highly efficient Computerized Management System (CMS). This system allows improved administration of sales, manufacturing, purchasing, fabrication management, shipping, customer service, and quality analysis, allowing them to ensure the best CQTS (Cost, Quality, Delivery & Service) for customers. The goal is to offer total solutions that satisfy customer's requirements. Mean Well have earned their good reputation based on the quality, competitive prices and punctual delivery of products. This reputation has enabled Mean Well to enjoy an average of 28% sales growth in the past few years. For the company profile - click here. Meanwell company profile video - click here and click here. What does Mean Well mean to you? 'Mean Well' may be a name that is unfamilar to you. Perhaps you have purchased the one of the brandnames below? These are often large companies that supply a wide range of electronic equipment, whereas Mean Well specialize in power supplies... or power related products only! Many of these brandnames may, in fact, have their power supplies manufactured by Mean Well. Some of them simply rebadge the MeanWell product and sell it for significantly more! As for the name itself 'Mean Well' or 'MW' should stand for 'Manufactured Well' but the name, which was translated from Chinese, means more than it's dictionary definition - 'to have good intentions'. It may, or may not, surprise you that Mean Well Enterprises has adopted Confucius Analects as part of its corporate culture, 'Honesty and Sincerely', 'Active and Responsible' and 'Harmony and Unity'. The message from the President (Mr Jerry Lin) illustrates the importance the company places on the operation of a humble power supply - "If the CPU is the brain of a system, the power supply is it's heart, and often the value of losses incurred in a single failure can exceed the value of the power supply itself." Note, Meanwell has won the 2019 'Taiwan Excellence Award' for the DBR-3200 (3200W rack mounted power supply) and the LDPC-50A (Laser Diode Driver). Why you should buy MeanWell for use in Australia? Procon Technology is happy to provide any in-stock power supply to government, semi-government or large Australian company 'on-approval' for evaluation and testing over 30 days. Remember OEM, wholesale or re-seller and quantity discounts are available. It doesn't matter whether you are using; ABB, Aros, Absopulse, Agilent (HP or Hewlett-Packard), Allen-Bradley, Altech Corp, Amtex, Astec, Astrodyne, B+B, Bel, Block, Cabac, Cabur, Calex, Cosel, Delta, EA (Elektro-Automatik), Emerson, Excelsys, HiTek, IDEC, IMO, Lascar, Mitsubishi, Multicorp, MuRata, Omron, Phoenix Contact, Powerbox, Power-one, Powertech, Puls, Recom, Rhino, RS Components, Siemens, Snaptec, Sola HD, Statronics, SunPower, TDK-Lambda, Telemecanique, Traco Power, Weidmuller Ecoline or XP industrial power supplies, I'm sure we can find something on the Mean Well range to replace it at a more cost-effective price without compromising quality or reliability! Telephone us on 03 98306288 or email us with your requirements. NOTE some of these brands only provide a 1 year warranty. Meanwell provides 3 years with most units, 5 years for RSP (750W and above), RST, HRP/G and MSP, 6 years for HEP series and HLG series 7 years!!! Equivalent Meanwell part numbers to PowerBox/Delta PBC/PFC/PMT/PMF series: Please note that a smaller RS near equivalents are available for ALL PBC series power supplies, but the following are direct DROP-IN replacements... Replace the PBC-30, PBC-40 with RS-75 or HRP-75*... PBC-50, PBC-60, PBC-70 with RS-100 or HRP-100 or HRP-150*... PBC-100 with RS-150 or HRP-200 (side screw holes different)... PBC-150 with SP-150... PBC-200 with SP-200... PMT-200 with RSP-200... PBC-300/PMF-320WCG with SP-320... *note, on the HRP or HRPG units the terminals overhang by 15mm. Equivalents for the DUAL and TRIPLE power supplies are also available! The RS series provides direct replacements for the IDEC PS3X series. Also provides replacements for the PowerBox PBC series with higher wattage output. Why are some Meanwell power supplies not stocked in Australia? Any Meanwell power supply can be supplied ex-factory (often within 7 days by express shipment), however a number of Meanwell's range are NOT APPROVED FOR USE IN AUSTRALIA because they do not have the necessary certification. Non-approved models includes the SE Series and the new LRS series above 150 Watts! It is important to note that ALL of the power supplies above 150 Watts that we stock have Active Power Factor Correction (PFC), which is a requirement for C-Tick approval in Australia! Power Factor Correction is provided on all models with 'P' in the part number such as the SP, RSP, HRP and HEP ranges. Also all CLG, HLG, PLN, SDR models (NDR & WDR above 120W) and all AC power adapters above 60 Watts. Finally, supply of the obsolete S series is now only available with minimum orders of 200 units and the NES series has been discontinued in Australia, as this series does not have world-wide approvals and demand is low. We recommend the RS series or LRS series instead. Disclaimer: The above specifications are subject to change without notice. Please ensure the suitability of these products for your application before purchase. In applications where mains surges may occur (e.g. due to lighting strike) additional protective devices should be fitted... such as the Meanwell SPD-20-240P. Further note that the power supplies with open terminals are intended to be installed inside a "suitable" protective encloser with adequate ventilation provided. They must be installed by a qualified person according to local electrical authority regulations. Please contact us should you have any doubt. 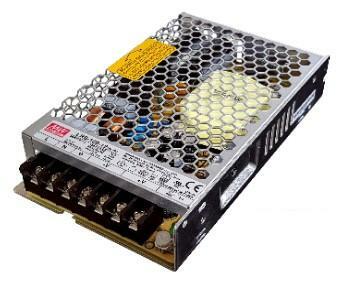 Some FAKE Meanwell power supplies* have also been sold by overseas suppliers - BEWARE! Always purchase from an authorised Australian Supplier! That way you'll be able to make a warranty claim if necessary and you'll also be assured that the power supply meets Australian Standards or has the necessary Electrical Safety Approvals AND works properly without interference! Further, BEWARE of suppliers or equipment imported from overseas that supply the SE series, these are only approved for use in the USA and Canada (and some other countries) where they operate on 110VAC. They are not approved for use in Australia or Europe where the mains voltage is 220-240VAC.